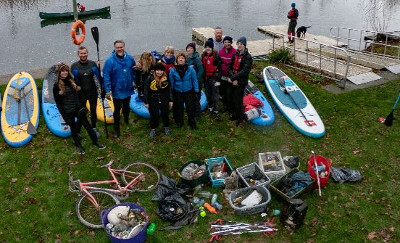 A PADDLE boarding club has teamed up with the Avon Navigation Trust to help keep its stretch clear of plastic and other litter. Worcestershire Bonkers Activities club has teamed up with the Avon Navigation Trust and is using paddle power to sweep its stretch of the river clear of plastic, helping to keep it one of the cleanest rivers in the UK. Bonkers Activities members have already hauled out a heap of carelessly cast off rubbish, including plastic bottles, cans and a bike. “We’re delighted to welcome the club on board to help us to protect our river and the environment.